The cruise industry is quickly heating up in Dubai, as the United Arab Emirates' popular desert city is on track to shatter passenger records for the 2014-15 season. According to AsiaCruiseNews.com, Dubai Cruise Tourism forecasts 381,000 passengers to arrive on 110 total cruiseship calls at Port Rashid over the next seven months. That figure, which includes travelers embarking, disembarking and transiting at Dubia, marks an increase of 19 percent over last cruise season. GulfNews.com's Sarah Algethami notes that the six vessels currently using Dubai Cruise Terminal as their home port are expected to make 83 trips this season, a nearly 32 percent increase from 2013-14. 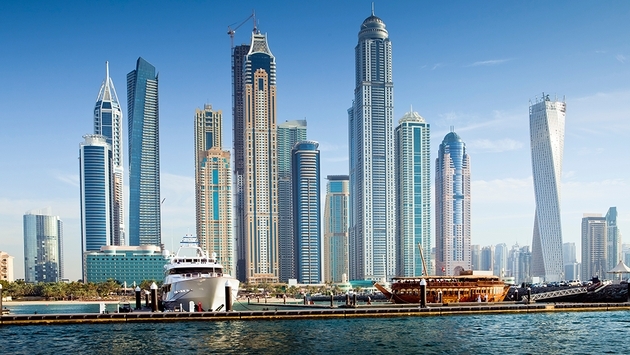 The cruise season in Dubai begins in October and runs through the spring. "We have set ambitious growth targets for cruise as part of our Dubai Tourism Vision for 2020 as we aim to become the world's leading destination for family tourism. Not only are we actively seeking to increase the volume of cruise travellers from the traditional source markets of North America and Western Europe, but we are also looking to attract first time global cruise travellers from China and the Far East, as well as India and the sub-continent," said Dubai Tourism executive director Hamad bin Mejren. "We also believe there is a real opportunity to grow intra-regional cruise tourism with our GCC neighbours which is why we expect to welcome 450,000 annual cruise tourists by 2016 and to record continued, sustainable growth into 2020 and beyond," bin Mejren added. Boasting warm temperatures and sunshine year round, Dubai has become an ideal operation base for cruise lines and a favorable destination for travelers during the winter months. Dubai’s Department of Tourism and Commerce Marketing cites the opening of a new 27,000 square meter terminal at Port Rashid later this year as well as a new visa rule as key factors for the tremendous growth in the city's cruise tourism. According to Algethami, the new visa rule took effect back in August and "allows tourists to enter the UAE though any of its ports, travel out of them and come back on the same visa." The rising number of travelers cruising the southeast coast of the Persian Gulf is sure to generate plenty of buzz in other parts of the world. And Dubai Cruise Tourism is counting on it as it hopes to reach its goal of one million cruise tourists by the end of the decade.